Happy Friday everyone! I'm glad the week is finally coming to a close since I've got a fun-filled weekend in store - lots of recipe testing/shooting, a CrossFit party with Brittany, a Virginia Bloggers meet-up on Saturday, and we are hosting a small get together on Sunday. Whew! I knew this week and weekend was going to be crazy busy so I tried to prep ahead as much as possible. Included in my prep this week - muffins! 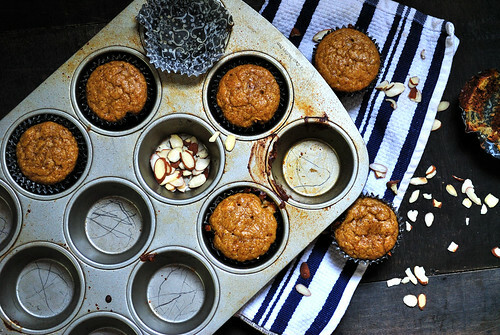 Grain-free, sugar-free, dairy-free banana almond muffins to be exact. 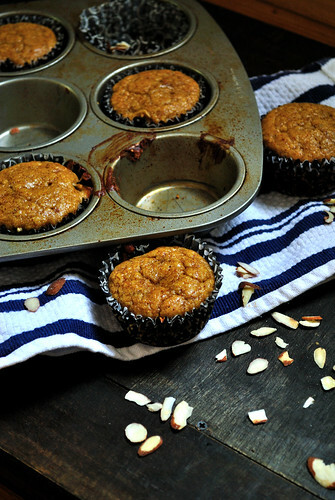 These muffins are paleo/primal friendly and make a great grab-and-go breakfast or snack. I'm always hesitant to label something according to a diet, i.e. "paleo" or "primal", because I feel like people can get a little defensive about it and because I don't believe in "diets". As we've talked about before, living a healthy life is a lifestyle, not a 90 day diet. It's about making a commitment to yourself to treat your body well and do what makes you feel good, regardless of the label that's slapped on it. Now, I'm not bashing labels - labels are useful for many things and it often makes it easier to explain something, like your style of eating, to someone by using the label. But labels can also be restricting. For myself, I eat a diet that would be consider "modified paleo/primal" since I do eat some dairy in form of cheese and greek yogurt, and will occasionally have grains such as corn (yes, it's a grain) because I love my chips and guacamole. Personally, putting a label on my diet (minus "gluten-free" because that's a medical requirement), makes me get a bit stabby - my mind instantly wants to rebel and I end up self-sabotaging (it's like being a teenager all over again). Instead, I eat what makes my body feel and perform it's best. For me, that's a high fat (coconut oil and avocado for the win! ), moderate protein (yay for muscles), and low carb (insulin resistance and carbs are mortal enemies) diet. I stay away from grains because I feel sluggish after I eat them. I stay away from sugar because it gives me headaches, makes me breakout, and sends my insulin resistance into overdrive. I limit dairy because my stomach loves me for it. Most people would call this a primal or modified paleo diet - and I'm okay with that. I tend not to label myself that way because I actually disagree with some core scientific tenants of both philosophies. Even though I disagree with some things, I do think a lot of people can benefit from eating a paleo-esque diet. Some people can't though - my mom, for instance, has to have a lower fat/ lower meat diet because she had her gallbladder removed. Different strokes for different folks. Now what the hell does this have to do with muffins? Nothing really, except that I labeled them paleo and used that label for the first time on the blog. So, uh yeah, sorry for the rambling - it must be all the handstands in Crossfit this morning. 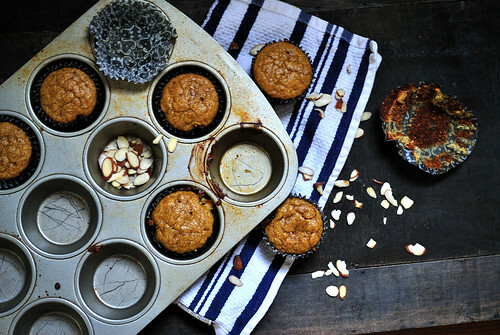 Anyways, make these muffins and enjoy - paleo or not. P.S. Don't forget to enter the magazine giveaway! 1. Preheat oven to 350F and line muffin with muffin liners or grease well with cooking spray. Set aside. 2. In a large bowl combine almond meal, baking powder, cinnamon, and salt. Whisk to combine. 3. In a separate bowl, mix eggs, almond butter, and mashed bananas together. 4. Add wet ingredients to dry ingredients. Blend until smooth with an immersion blender or food processor. *(This may not be necessary if your almond flour is super fine. I make mine at home so it's a bit chunky and blending it helps smooth things out). 5. Divide batter evenly amongst muffin tins and bake for 25-30 minutes or until a toothpick inserted in the center comes out clean. Delight Magazine: Announcement, Recipe Database, & A Giveaway!